PORTRUSH Hockey Club held their annual dinner and presentation of prizes in the Central Bar, Ballycastle, when awards were handed out for the season just ended. 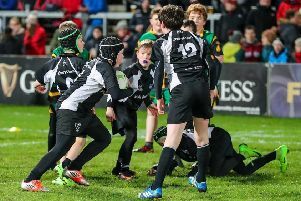 It was a season of mixed fortunes for the club but officials have been buoyed by the fact that an influx of young players from Ballycastle High School will reap dividends in the future. Funding has been secured for more dedicated training and it is hoped this will improve the playing ability of the team for next season. Portrush field two teams and tribute was paid to the dedication and commitment of all players. Aaron Kerr won the First Team player of the year award while Ricky McKinnon was voted Second team Player of the Year. John McMullan won the Young Player of the Year in his first season at the club and John Dillon and Andy Dalzell shared the top goalscorer award with 16 apiece. The most improved player was Calum McKeeman and Clubman of the Year was Colin Manson.